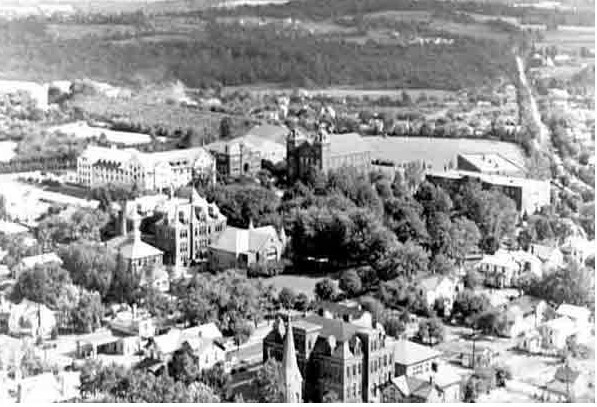 Aviation and Clarion State Teachers College in World War II. In 2014, Clarion University has an enrollment of more than 6,000 students. In 1936, before the USA’s entry into World War II, its predecessor Clarion State Teachers College had an enrollment of only 193. While the Great Depression of the 1930s had already negatively impacted the overall enrollment, the peacetime draft that started in 1940 to prepare the US in case of being sucked into the war in Europe reduced the number of male students even further. The number of men on campus would drastically improve, however, as a result of Clarion State Teachers College hosting various flight training programs including the Civilian Pilot Training Program (or C.P.T.P.) and, later, a unit of the Army Air Forces College Training Program (AAFTP). The Civilian Pilot Training Program (or C.P.T.P.) was started in 1939 by the Civil Aeronautics Authority (or C.A.A. ), the forerunner of the Federal Aviation Administration in the Civilian Pilot Training Act. General H. H. Arnold, Chief of the US Army Air Corps, had noticed the lack of American pilots in comparison with the large number of German pilots and advocated for this program which started the same year that World War II began in Europe. As the US had a great need of pilots, the government funded the C.P.T.P. as a means of supporting college students gaining experience flying gliders and small craft in the event that the US might later be dragged into the conflict. The federal government would pay for 72 hours of ground school and 35 to 50 hours of flight training (and the cadets would live in campus housing). Paul G. Chandler, President of Clarion State Teachers College, saw this as opportunity for his school to both help the country’s need for pilots as well as bring more enrollment to the campus and so he decided to have Clarion join this program. Thus, Clarion became one of many colleges involved in the C.P.T.P. In the summer of 1942, Clarion College faculty taught ground school portions of the course while army personnel provided airplane and glider training. So, well-known Clarion instructors such as Coach Waldo Tippin taught physical training and Professor Paul Peirce taught science. 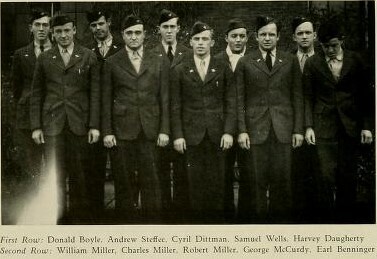 The first group of pilots graduated in November of 1942, and two more classes of pilots graduated that fall and winter. The C.P.T.P. was transformed into the “War Training Service” (or WTS) after the USA entered World War II following the Japanese bombing of Pearl Harbor. This was the Air Corps’ attempt to accelerate the number of flying officers (in the same way the Navy created the V 12 program at colleges to increase the number of naval officers). As the Air Corps grew in size and importance, it was reconfigured and renamed the US Army Air Force and the WTS eventually became known as the Army Air Force Flight Training Program (or AAFTP). Clarion’s unit was officially the 337th College Training Detachment (Aircrew). Through all three incarnations, C.P.T.P., WTS, and AAFTP, Clarion State Teachers College played an important role in preparing young men to become airman by giving them military training, ground training, and flight training. In the Spring of 1943, over 300 cadets were in residence on the Clarion campus. 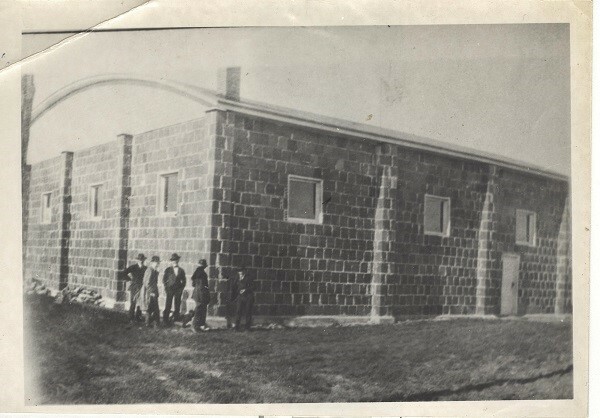 The cadets of the 337th College Training Detachment lived in the vacant men’s dormitories at Clarion State Teachers College where they also took flight training and drill. They did their flight training at the Parker-Cramer Airport just a mile down Main Street from the campus. Clarion was a perfect location for the 337th College Training Detachment (Aircrew) because they could make use of the empty dorms and faculty for ground training and then march a mile down the road to the Parker-Cramer Airfield to do flight training. The aviation unit created its own biweekly newsletter (The Clarion Cub, probably named after the Piper Cubs used for training at the Parker-Cramer Airfield) which reported on events on campus and in the community. It also served to disseminate information about the aviation program to friends and families of the cadets. Several issues of The Clarion Cub survive in the archives of the Carlson Library at current Clarion University. They reflect the wide-ranging background of the pilots in training (students from such colleges as Cornell and San Francisco State College as well as volunteers from various branches of the service). The issues are also packed with scores of softball, basketball, and ping pong matches. The cadets kept busy. Due to the draft, there were very few men were on campus during World War II aside from the cadets. The young women of the Delta Sigma Epsilon sorority chapter on campus noticed this and performed a skit about the impact of the air cadets on campus life. In the 1945 Clarion College Sequelle the memories section recapped events from all four years of the seniors. The editors recalled how in their freshman year, there was still a number of male students at mixers and dances, but then most of the boys were drafted. They recalled how when the C.P.T.P. and then later Army Air Corps cadets come to the campus, a dance was held in honor of their arrival. They noted that the “campus was like a different world, cadets marching ‘n singing on every walk.” The yearbook went on to lament the departure of all the cadets by the end of the junior year (although campus publications reveal that some marriages did emerge out of the interaction). By mid-1945, as the war in Europe ended, the flight-training program at Clarion had closed. The cadets had moved on to other training and combat and the federal government felt there were now enough pilots. 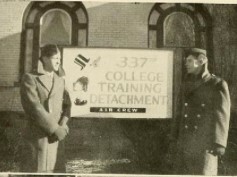 Even though the cadets were at Clarion State Teachers College for just a few years, they gave the Clarion area an opportunity to support the war effort by helping train and house the 450 or more young men during their service in the 337th College Training Detachment (Aircrew). Describing the success of the program, Clarion University’s official history relates that President Chandler stated "The government paid well for the training received by the Cadets. This carried us through those very strenuous financial times and nineteen Clarion girls found mates from among the trainees." Clarion Takes Flight: A History of Aviation in Clarion County. “It would be wise for us to take advantage of this new thing called aviation” were the words of Clarion’s city fathers shortly after the beginning of aviation. From the days of propeller-driven biplanes to the current world of the jet age the small town of Clarion has a unique tale to tell. Like any good story it has its triumphs and tragedies, colorful characters, and unexpected surprises. However, even the most intriguing story has humble beginnings and this one is no exception. When Brookville pilot Earl Sandt landed at the county fairgrounds in 1912, the story of the area’s aviation history began. Shortly thereafter, Max Miller touched down at the site that would later become Parker D. Cramer airfield (behind the old BiLo Supermarket on State Route 322) and soon the Clarion Aero Club, one of the first in the country, was established in 1919. With the groundswell of interest in aviation, efforts quickly developed to establish a working airstrip. Under the urging of groups like the Areo Club and individuals such as Senator W. Wayne Hindman, the citizens of Clarion raised an incredible amount (at the time) of $1,500 to help fund the airport and by 1919 the nation’s first municipally owned airport was completed. During the airport’s first decade of existence, its bread and butter was the U.S. Air Mail service. While at first glance Clarion might seem an odd place for an aviation hub, a look at a national map reveals it to be a halfway point for the important New York to Chicago route being flown at the time. Clarion’s geographic location made it a perfect place for the prop driven biplanes of the time to either rest and refuel or provide safe harbor if foul weather loomed ahead. If the skies ahead were ever menacing, once a pilot saw the steeple of Clarion’s courthouse he would know shelter from the storm was only a mile away. Even if a pilot were to go down, they could at least be reassured rescue efforts would be launched from Clarion to track them down in the “graveyard of the Alleghenies.” With its importance as a stop on the Air Mail service, Clarion would continue to grow in importance for the rest of the decade. Despite a violent windstorm in 1923 destroying the hanger, the Clarion Aero field was designated as an air terminal for the mail service. With the title came electric lighting for the field and a weather reporting headquarters to advise pilots whether or not to continue flying or to land for the night. When in the same year the New York to Chicago route began to be flown at night, the Clarion Aero field’s status was moved to “intermediate” and outfitted with route identifying beacons and landing lights for night operations. Last, but not least, that year also saw passage of the Kelly Bill by the US Congress allowing private companies to sign contracts for the mail service business. Locally, contracts fell to arguably the region’s most famous aviator (and the airport’s later namesake) Parker D. Cramer. As a result of its location, its citizens’ commitment to aviation, and fortuitous decisions, Clarion would continue to hold its position in the airmail service for the rest of the decade. However, by the early 1930s technological innovations in aviation forced the mail service to reevaluate what fields were needed and the Clarion Air terminal fell victim to the chopping block. Planes’ improved speed and range made a stop at Clarion unnecessary and in 1932 Clarion was eliminated from the Air Mail service and the area’s first phase of aviation history was brought to an end. However, local flyers continued to add to the area’s history during the 1920s and 1930s. When discussing local aviators of the time period the most prominent individual is without a doubt Parker D. Cramer. Shortly after his birth in Indiana in 1896, the Cramer family had moved to Bradford where young Parker Cramer soon fell in love with the new field of aviation. After acquiring one of the earliest pilot’s licenses, Cramer became the first pilot to land in Bradford in 1919 before moving to Clarion in 1920. During his time in the area Cramer formed multiple aviation companies, first with local stuntman Jack “Red” Bartow and subsequently with his brother Bill Cramer. Parker Cramer was indispensable in advocating aviation’s importance in the area. By 1925 Cramer already had received the local contract for mail delivery and in 1927 he received the position of inspector for the Department of Commerce and oversaw all aviation activity in the county. However, it seems Clarion was simply too small to contain Cramer’s ambitions. In addition to his local activity, Cramer was an avid adventurer whose ultimate dream was to map the “Great Circle” mail route from the U.S. to Europe over the North Pole. After a failed attempt and crash landing in Greenland in 1928, Cramer was welcomed home to a hero’s welcome. The local airport, which had up to this point been named Clarion Aero field, was renamed in his honor. Unfortunately, in the end Cramer’s passion would be his undoing when in a second attempt to map the route during 1931 Cramer disappeared somewhere in the North Sea off the coast of Norway. While wreckage from the plane was found, the disappearance of one of the region’s most famous aviators still remains a mystery. Although Cramer is the most well-known area pilot of the time, he was certainly not the only one. While Cramer may have been getting most of the headlines others made their fair share of contributions (and some comical failures) to the local aviation scene. For example Parker’s younger brother Bill invented a three light system to indicate to pilots whether or not to proceed beyond Clarion to their final destination. While passing over Clarion pilots were instructed whether to proceed, land, or use their own judgment. Additionally, in 1936 Cramer’s former partner “Red” Bartow perfected modern runway lighting and rotating beacons for night landings (basic principles still used today across the country). Meanwhile, local aviator Sparky Kratzer produced lights to illuminate hangers when a low flying plane was detected. Unfortunately for poor Sparky, passing trucks had a tendency to have the same effect. In the end even though the mail service had left, local pilots like the Cramer brothers and Bartow continued to make for a lively aviation scene for the area. Local stuntman Jack “Red” Bartow. While one might most closely associate Clarion’s war effort with the industrial plants around the area, Parker D. Cramer airfield did its fair share also. In 1938 with war looming in Europe and the Pacific President Roosevelt authorized the Civilian Pilot Training program, or C.P.T. The idea of the program was to train civilian pilots at universities across the country, including Clarion, and private flying schools to build up a pool of potential pilots for any future conflict. When war came in 1941 Clarion’s program was accelerated and the first class reported for training on September 21, 1941. 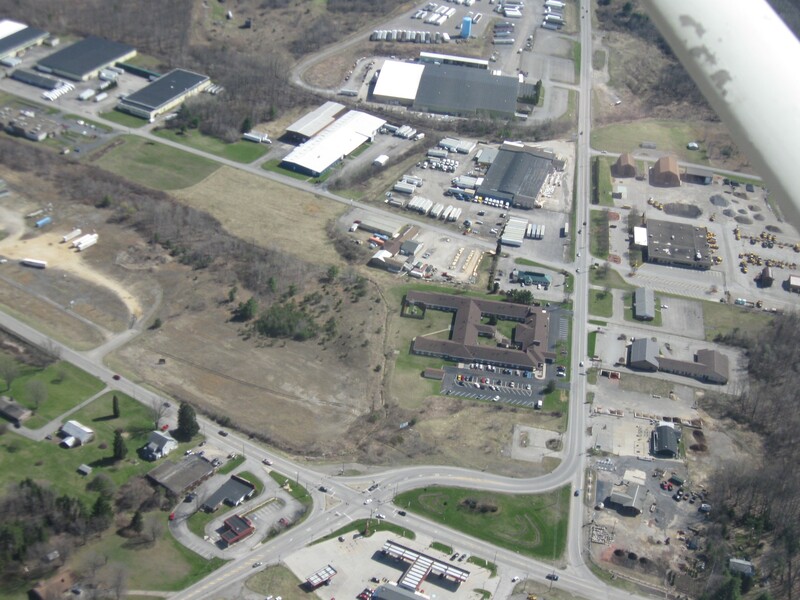 Prospective glider, reconnaissance, and patrol pilots were housed on the Clarion State Teachers College campus while taking their basic flying instruction at Parker D. Cramer airport. Cadets would take basic ground training on the Clarion campus followed by basic flight training at Parker D. Cramer. Upon completion of their training and final exams, cadets would ship out to army and navy facilities across the country for further training and eventual deployment. Meanwhile, the program made itself felt beyond the campus with Clarion staff teaching such courses as Physical Training and aeronautics and having local outfits provide maintenance and basic flight instruction. By war’s end, hundreds had passed through the program and Clarion aviation once again had a brief spot on the national scene. However, with victory in Europe and the Pacific, aviation in Clarion County would again shrink to a local phenomenon. 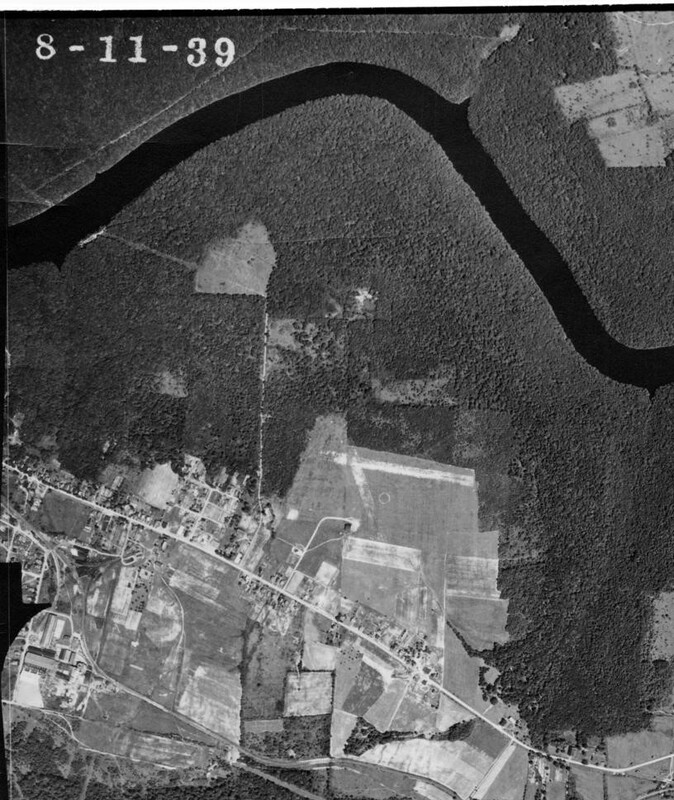 During the decades after the war the county would see its second airport and a return to the smaller scale local aviation that had characterized the 1930s. For the public scene aviation would shift to the privately owned Rhea Airport (also called Rhea’s Field) located at the intersection of State Route 66 and US 322 (across from the current Country Fair Market and Gas Station). 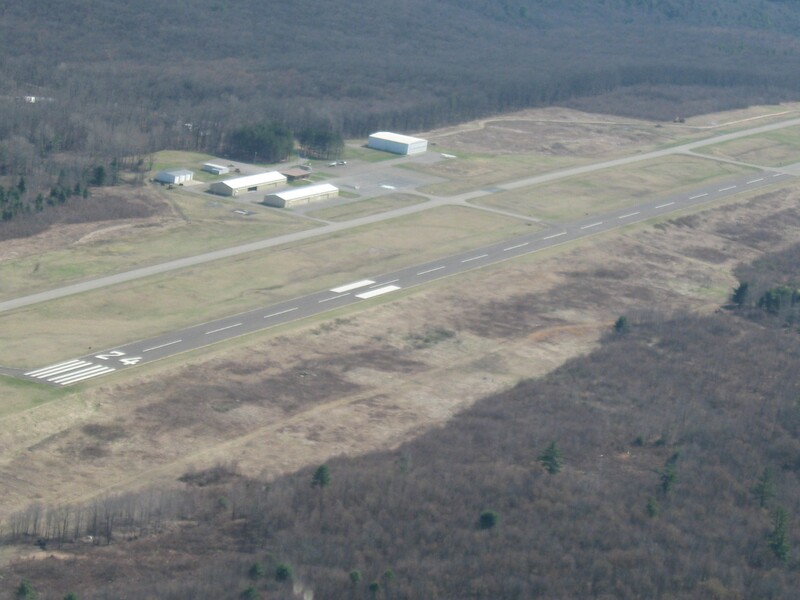 This new airfield gained a commercial license in the early 1950s shortly after its completion and replaced Parker Cramer airport as the county’s public face of aviation. 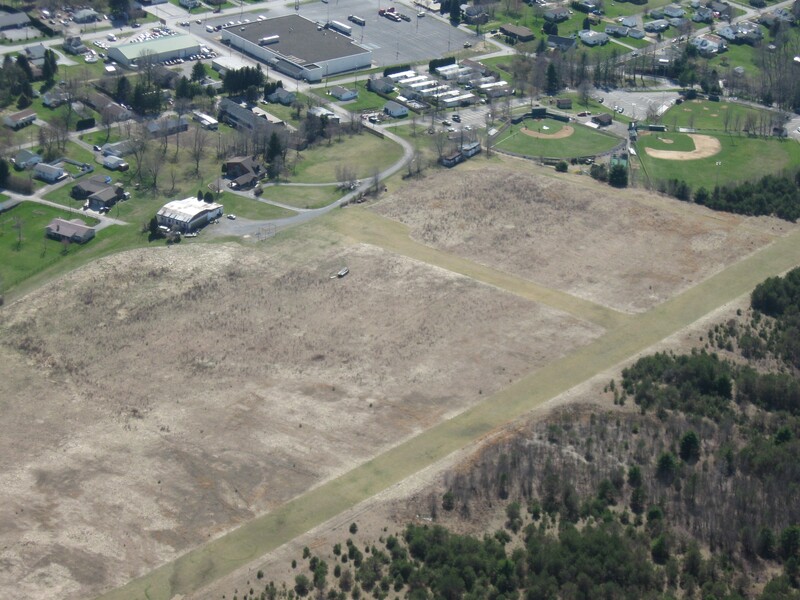 While the new airfield offered a larger landing strip and more modern facilities, its dirt airstrip would quickly be outdated with the coming of the jet age and flying during the 1950s and 1960s would shift away from small airports in general and to Franklin and Dubois locally. Meanwhile, the Parker D. Cramer Airport continued to be a hub of private aviation despite it being taken off the official air maps upon the opening of Rhea Airport in 1954. Often during this time the Parker D. Cramer Airport, now under private ownership, would host “fly-ins” for private owners of airplanes. During these “fly-ins” private owners would fly restored, experimental, new, or even home built airplanes to the field and in doing so keep the spirit of the original “barnstormers” such as the airport’s namesake Parker Cramer. At the same time private groups such as the OX-5 club, named after an early airplane engine, celebrated local aviation history by keeping its story alive both orally and physically in the form of such individuals as Bill Cramer who were part of the club. Despite private aviation’s continued strong showing and consistency public aviation would see some drastic changes going into the 1970s. 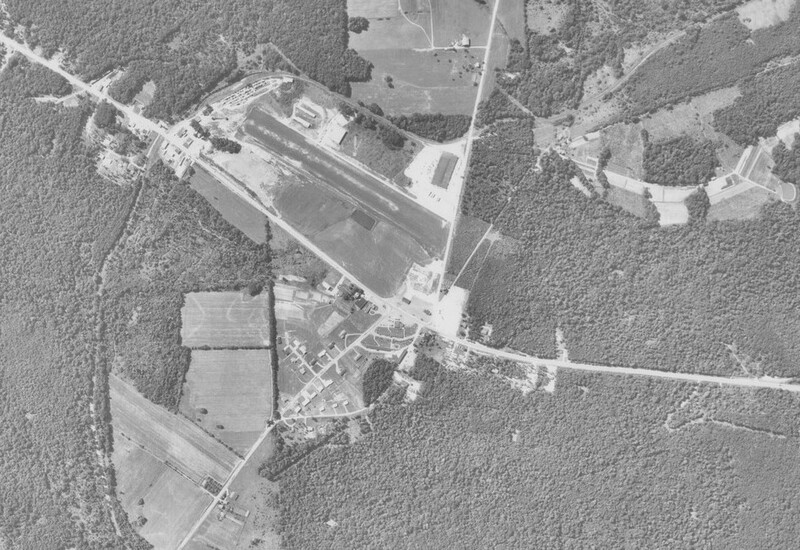 Due to planned construction on US Route 322 and plans to further develop the area with such attractions as a strip shopping mall, Rhea Airfield had to be abandoned and planning began on the current facility. Coming full circle the current airport (Clarion County Airport) was billed as a fuel stop for the New York to Chicago route that started aviation in the county back in the 1920s. Completed in 1975, the current airport offers a base for privately owned planes, offers passing aircraft the chance to fuel up, a pilot training program, and still embraces the areas rich past by holding air shows. Also while Clarion may not be at the same level of prominence as it was in the 1920s, it is still home to Squadron 504 of the Civil Air Patrol and Chapter 994 of the Experimental Aircraft Association and thus educates area youth on the subject of aviation. In summary, Clarion and the surrounding county has a rich history in the area of aviation spanning many decades. From the early days of pilots like Parker Cramer to the present day the story the area can tell is both riveting and surprisingly deep. 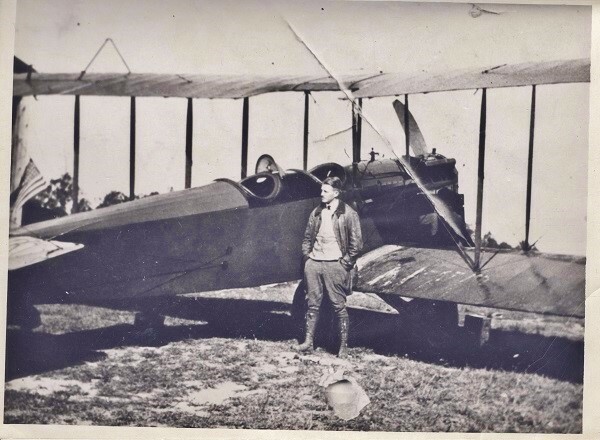 The story of Clarion County’s aviation history proves that for many subjects if you simply dig a little deeper you will often find more than you could ever imagine.